Flying into cities in the Gulf states at night is an interesting experience. Unlike many countries, there are virtually no small towns between the massive cities. So, you will fly along in complete darkness and then all of a sudden find yourself on top of a brilliant, swirling metropolis. They remind me of elaborate crop circles (remember those?) of lights. Flying into Qatar… I haven’t altered this photo in any way – those colors are genuine. Arriving in Islamabad was a bit different. 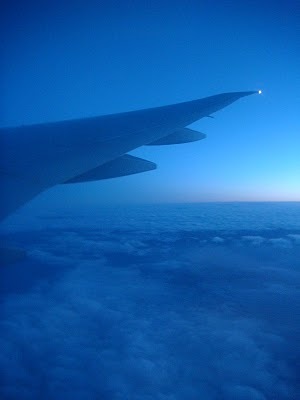 I arrived at about two in the morning (Pakistan time) and just as the jet was landing, half of the city went dark. It was interesting to see. I sailed through Immigration, but still had hours to wait until the rest of my crew showed up. So, I went to the front of the airport and started hanging out with all of the taxi drivers that congregate there. They all offered to take me anywhere I needed to go and several offered me tours of the city. After some reflection, I decided this wouldn’t be a bad idea given the amount of time I had to wait still. So, I accepted a tour with the driver pictured below on the far right. We drove around for about 45 minutes or so through urban areas, past the recently bombed Marriott Hotel, through residential areas – all over the city and I don’t remember any of the names he mentioned. With no prompting, the driver suddenly asked me if I liked motorcycles. I perked up and answered in the affirmative at which point the driver became excited and said that he had to introduce me to his nephew. Now, remember that it is about four in the morning in Pakistan… We rolled up to the nephew’s house and, of course, he and his family were sound asleep. No matter, we went crashing inside and soon the entire family was rousted to greet the American guest. Far from being put off by my untimely intrusion, the family was giddy with excitement to have me as a visitor. After a few moments, I realized the nephew was a skilled rider and I relaxed a little. He took me to a wooded area that was apparently popular with other riders to run through because there were many of them there on sportbikes. Some of the other riders were giving their all to a route through the woods and as genuinely good riders in their own right, were shocked to see someone blowing by them doubled up. But even though many people tried to race us, no one could keep up with the nephew. Eventually we made it back to the nephew’s home where I was treated to a remarkable breakfast prepared by his wife. Then the whole family accompanied me back to the airport and waited with me until my guide arrived from Britain several hours later. The taxi driver absolutely refused to let me pay him for the tour and as hard as I tried to extend some token of appreciation to his family (even trying to buy them lunch), all of my efforts toward generosity were resolutely refused. After being treated like this, I get even more annoyed now when I hear people make comments about how we should just nuke Pakistan. Or comments about how everyone in the Middle East hates us. Yeah, right. Imagine a family of Americans treating a stranger from the Middle East in the princely manner I was treated. 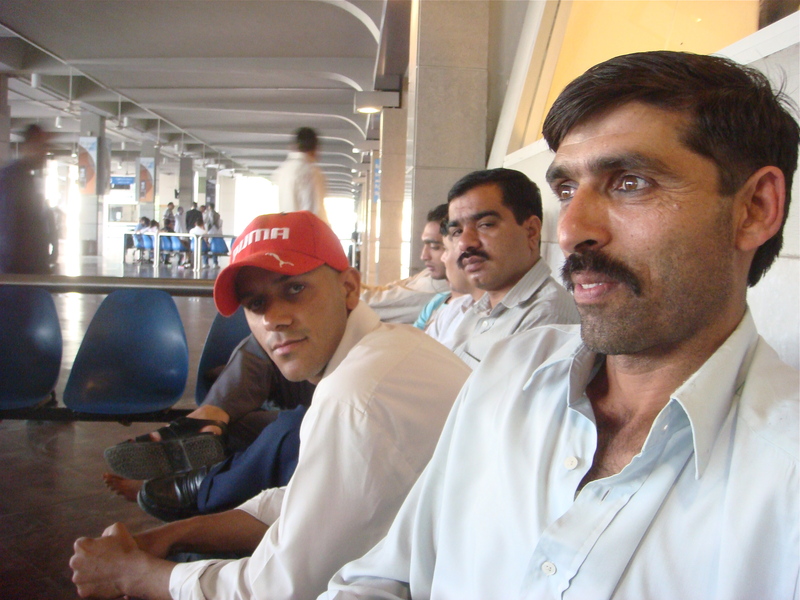 Tags: Islamabad, Islamabad Airport, Justin Ames, Pakistan. Bookmark the permalink. Nice Posts my friend. Glad to know that you were treated good despite of all the political craziness. I’m always astounded by how hospitable people are to you in other countries. Hard to find that kind of behavior here. Do you know if the Pakistanis aware that some in America feel that way about them? It really is a pity. Yes, most people I have met on my travels are able to distinguish between individuals and the actions of their government. Yes, most are aware, Casey. It’s just that inn this part of the world, we get excited at the sight of guests! I’m glad you enjoyed your first moments in Pakistan. What did you think of Qatar, by the way? My experience in Qatar was unfortunately limited, literally, to a few hours as it was just a layover. My impression, right or wrong, was that it was pretty similar to the UAE. See us Pakistani’s are a hospitable people. We love meeting foreigners and showing them around regardless of what people in other countries think. It’s just the Islamophobia that has gotten everyone on edge about Muslims these days. This is such a beautiful story. It goes to show you the power of the human spirit. Very inspiring! The kindness of strangers can be endless and surprising when you’re traveling. You discover that there are almost no walls at all when you get up close and personal. This story is absolutely awesome! Great experience! I’m very glad you had a good experience. Generally, things go much better on a personal level than on a political level. I do, however, think you were seeing through your rose-colored glasses as you just skip over any talk of the “recently bombed Marriott Hotel.” I wonder what is happening in that region to cause that, hmm? I think if you read some of my other posts, you’ll see that I am not a rose-colored-glasses type. I was shot at and just missed being blown up by a roadside bomb in Afghanistan. It’s just that I’ll call a situation as I see it. The people in this story were great to me and that being the case, I recounted the story in the positive manner it which I experienced it. I wonder if an Indian would have got this treatment. I wish it did. It would help heal a lot of wounds. there were trains full with Indian Sikhs at their yearly pilgrimage to Punjab Province of Pakistan recently. They received hospitality as well! Justin glad to know that you survived through those attacks in Afghanistan. Thats nice to know Umer. I am planning to visit Pakistan. I hope even I get the same treatment. As I mentioned above, they weren’t meant to be taken personally, I believe. And it made the trip more interesting. I will surely visit Pakistan. After reading these comments, the urge to visit Pakistan is even more. Well Rohit, even an indian would be given this treatment…were given when there was a match in pakistan and lot of we people had go there and treatment was no different, they offered their place to stay and dropped to venue without fares, it has happened…. it is the Governments who create such impressions, people at grassroots at both places are no different!! Just the economy due to again obvious reasons, government!!! Thats really heartening to know. ‘Wow’ is the feeling when I read your comment. Sounds like you have a good time. Props for getting on the back of a bike with a stranger as I probably wouldn’t even do that if there was a professional rider driving. But, I’m sorry, I may have to be a wet blanket here. I live in the UAE (I see you’ve been but haven’t had time to read the post, hope you enjoyed it) and haven’t really ever felt like I was welcomed. Singapore, great. Indonesia, awesome. Malaysia, Thailand, Turkey, yes…but never really in the mid East. It sounds like you met some genuinely nice people but my experience has always been quite the opposite. Sorry to hear about your experiences in Afghanistan, glad to hear you ended up well. Where’s your next trip planned to? If you’re ever up in Dubai and feel grabbing a shwarama, let me know. While I didn’t care for the UAE, I did find the people I interacted with to be quite pleasant. However, with one notable exception, I was dealing mostly with the working class of the UAE – the Indians, Filipinos, Pakistanis, etc. – rather than the citizens of the Emirates. Might have had something to do with it. In regard to Afghanistan – It made the trip more interesting. Also, there was positivity embedded in even the roadside bomb experience… The car behind mine was the one chosen to be blown up. The bomber let me – an obvious Westerner – go by unscathed. And being fired upon… I say I was shot at without malice. I found myself on the front lines – what could one expect? Sounds like an adventure. I don’t think I would have been in such a good mood if awakened by visitors early in the morning. This is a great story. You are brave … for not wearing a helmet. There are good people in every part of the world – glad you met some of them. Haha. Izzie, if there had been a helmet available, I definitely would have worn it! And, yeah, there are good people everywhere. I’ll second your comments on Turkey. We had a great time there with the locals. I just came across this post very randomly from the front page of wordpress when going to log in. What an amazing story! It sounds like the sort of travel tale you always want to have, dream of having, but only happens in stories or to friends of friends. Thank you. I’ve had a lot of good luck with these types of experiences seeming to happen fairly often. This is a great article and I whole heartedly concur. I have the pleasure of opening my house to a student from Lahore for the past 3 years and this is one of the best young men I have ever had the pleasure to meet. I had a very bad accident last new years eve 2009, five days before I was to start a new job. I am single and 49 years old and could not drive. For 5 months I was on crutches and he drove me to work and back (40kms) each way in peak hour traffic and all in his final year at uni while doing his thesis. My own daughter would not have done this. Their culture is one of respect and their hospitality is second to none. It is such a shame that a lot of people get only the bad reports through the media. I am glad to see your blog well done. You’re a real deep thinker. Thanks for sharing your experiences of Islamabad and Pakistan. What a wonderful post. Blogs like your are the only reason I check the freshly pressed section of word press. If only more people would put aside their typical American fear and get out and travel, they would truly understand the generosity of foreign culture. I couldn’t agree with you more on the benefits of Americans getting out and exploring more. Wow, great post – very interesting. Thanks for sharing. @ cpyouth , FYI – Pakistan is not in the middle east. lot of people here in the USA think that all Muslim countries are located in the middle east. I think this kind of hospitably exists where poverty exists because those people are truly happy people and they have the peace in mind to entertain people in such a manner. It doesn’t follow logically, but there does indeed seem to be more happiness in poor communities. If you pass through a wealthy area, one will often find that the people are uptight, anti-social and seem pissed off all the time. I’ll leave it to a psychologist to explore why. Good and bad people everywhere and hence its important to judge people case by case then just paint a country and its people with the same brush. Also as others have said,glad you had a good time and enjoyed your stay,plenty of more to see if you ever decide to come back. Coming back is definitely in the cards… I know that I barely scratched the surface last time while visiting the NWFP. And, yes, you’re absolutely right about encountering good and bad people everywhere. More good than bad if my personal experiences are any indication. It sounds like you had a good time (even with the nail biting bike ride)! It’s too bad there is so much racism and political nonsense going on in todays world, but it’s good to know that there are people out there who aren’t affected by any of these opinions. It sounds like you picked the right cab driver! I still can’t believe he busted into his nephews house at that hour lol, but the family sounds really nice!